Ukrainian President Petro Poroshenko proposes including representatives from NATO member states in the supervisory board of state-run Ukroboronprom Concern. "It is necessary to immediately resolve the issue of expanding the group's supervisory board with international specialists from partner countries that are members of NATO," he said, opening a meeting of the National Security and Defense Council of Ukraine in Kyiv on Wednesday. According to him, Ukraine has nothing to hide from partner countries given the country's further integration into NATO. 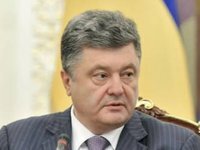 "And this will help Ukroboronprom's enterprises implement standards necessary for our entry into the Alliance," Poroshenko said. Including specialists from NATO partner countries in Ukroboronprom's supervisory board is step to implement the Law on the National Security of Ukraine, he said.